Cecilia Wang in World Affairs on 18 May, 2017. Some of Trump’s Executive Orders signed during his first 100 days have garnered considerable controversy, especially his ban on travel from residents of seven Muslim-majority nations. The 100-day milestone has always been the occasion when Americans try to assess the achievements and setbacks of their newly elected president. It is no surprise that when it comes to Donald Trump, his reign has proven as divisive as his campaign. On the domestic front, Trump achieved major triumph by confirming Neil Gorsuch to the Supreme Court. Gorsuch was Trump’s choice to succeed the conservative Justice Antonio Scalia. He was warmly welcomed by Republicans in the Senate, but fervently rejected by the Democrats. The nomination was confirmed despite an all-night filibuster by a Democratic senator and a historic rules-change forced through by Republicans to allow Gorsuch to be approved by a single majority, rather than the two-thirds usually sought. However, the narrow victory itself, 54 votes to 45, epitomises the worrying partisanship that has so far characterised Trump’s reign. Republicans’ decision to “go nuclear” to force through their candidate vanquished any hope that nominees could be largely confirmed with a bipartisan consensus, as was done in recent history during Bush’s and Obama’s tenures. One significant achievement of Trump’s presidency has been the unexpected, dramatic boost of the stock market. This has completely defied pre-election predictions. The S&P 500 hit a high of 2400 at the beginning of the year and has stayed largely stable. The upsurge reflects considerable investor excitement following Trump’s promises regarding deregulation, tax cuts, infrastructure spending and the repatriation of overseas cash piles. 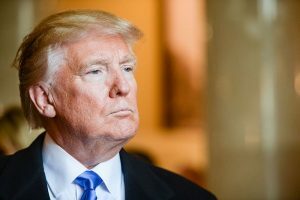 Trump has signed 13 resolutions to reduce regulations, a move the White House seeks to portray as “getting government out of the way”. However, it remains to be seen whether Trump can deliver on these promises. 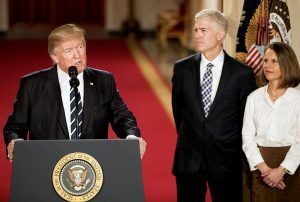 Trump’s confirmation of Neil Gorsuch as the new U.S. Supreme Court Justice was met with considerable controversy and passed only due to Republican changes in Senate rules. The seat has been vacant since the previous Justice Scalia died in February 2016. Republicans refused President Obama’s constitutional right to fill the seat. On the other hand, solid economic growth has so far been slow to come. Trump has failed to deliver the 4% GDP growth that he had promised on the campaign trail. In fact, according to the GDPNow measure by the Atlanta Fed, the U.S. economy only expanded by 0.5% on a quarterly basis in the first three months of the year. On the world stage, Trump has been praised by allies for his decisive move to punish Syria for using chemical weapons by launching missile strikes. Although the move is perhaps more significant symbolically, a real plan for a tangible future for Syria and the surrounding region has yet to be voiced by Trump’s administration. Nevertheless, the decision for military action directly contradicts Trump’s own promise during the campaign. The ‘America First’ isolationism that galvanised so many supporters was jettisoned, a potent symbol of Trump’s lack of principles. There is no visible pattern when it comes to Trump’s foreign policy. Antagonistic stances have been taken against North Korea and Iran with little effect. Meanwhile, Trump embraced authoritarian leaders in Egypt and Turkey, long-time U.S. allies. Praising of Russian President Vladimir Putin has stopped, and Trump instead has turned his attention to bettering relations with China, a country whose policies he vigorously opposed on the campaign trail. He also reversed his previous anti-NATO stance, instead favouring member states pay more to the alliance. Trump has sought to signal the freshness of his presidency by determinedly dismantling Obama’s legacy. He pulled out of the Trans-Pacific Partnership, a deal initially rejected by the Republican-dominated Congress and only signed as an executive order by President Obama. The move came as no surprise as Trump frequently incited nationalistic sentiments on the campaign trail by blaming international trade deals for job losses, in order to appeal to blue-collar workers who have lost out to globalisation and who flocked to him in droves. Trump’s first 100 days have been dogged by controversy, including collusion with Russia and spilling state secrets to them, hounding of the media, and a lack of domestic policies and foreign policy aims. 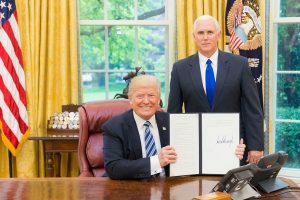 Trump’s ill-prepared attempt to abolish Obamacare, the signature healthcare policy of his predecessor, stands out as a major failure of his presidency. It was a humbling and humiliating defeat for Trump, who has campaigned on his prized reputation as a competent negotiator and deal-maker. The “debacle” further illustrated his characteristic lack of grasp for details. Another policy blunder was Trump’s executive order to ban visitors from seven Muslim-majority countries. It was ultimately defeated in the courts. A revised ban introduced weeks later suffered a similar fate. The travel ban has exposed Trump’s administration’s chronic lack of basic consultation and fact-checking, such as on the status of green card holders from the affected countries who would have been barred legal entry to the country. Trump’s battle with the media has only intensified since taking office. The president once openly rejected questions from a CNN reporter, claiming it to be fake news. His Press Secretary Sean Spicer has shared his tendency for factual inaccuracy and verbal spats, famously berating the media over reports on the size of Trump’s inauguration crowd in comparison to Obama’s. Personally, Trump has shown little desire to come across “presidential” as opposed to being merely the populist candidate. Notably, he refused to shake hands with German chancellor, Angela Merkel, although has remained on friendly terms with British prime minister Theresa May, with an invite for a state visit to the United Kingdom tentatively scheduled for October. Trump has welcomed leaders from across the world to the White House in his first 100 days as President, including British Prime Minister Theresa May, German Chancellor Angela Merkel and Turkish President Recep Tayyip Erdogan. He makes his first international trip as President to Saudi Arabia and Israel later this month. Trump is unapologetic about recruiting a cabinet dominated by multi-millionaires and billionaires and men – there are only four women. Trump presides over the wealthiest administration in U.S. history, with the wealthiest, Education Secretary Betsy DeVos, worth at least $500 million. Trump’s legislative achievements pale in comparison to his own agenda. The promise of a “new chapter of American greatness” is yet to materialise. He envisaged healthcare reform, a tax overhaul and a trillion-dollar infrastructure package. The farcical plan to build a wall on the Mexican border is rarely mentioned. The proposed tax cuts have been criticised as only serving the rich. Trump will mostly certainly rely upon Democrats to implement the infrastructure, who are unlikely to lend him their support given grassroots pressure. The failure to work constrictively with the Congress could potentially make Trump a president who rules only by executive orders. Trump’s inner circle has been in turmoil. “Alt-right” conservative Steve Bannon, the “Consellor to the President” has fallen out of favour. Initial hopes that his daughter and son-in-law Ivanka Trump and Jared Kushner could tame the president are staring to vanish. It remains to be seen who gains the upper hand in Trump’s increasingly chaotic administration. Trump’s approval rating, 44%, stands at a historical low for U.S. presidents’ 100-day benchmark, according to a CNN/ORC poll. However, this is about the same as pre-election data, indicating that despite many more controversies, few Trump supporters have lost faith in the president. Meanwhile, Trump has record high disapproval rating, at 54%, a 6% growth from February. Overall, whilst Trump has failed to win over voters who essentially disliked him; he has performed reasonably well in the sense that his supporters have not yet lost their hope in him. It remains to be seen if this will still be the case at the next landmark of Trump’s Presidency next January, one year after taking office.